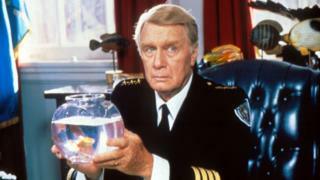 The actor George Gaynes died on Monday, at the age of 98, his daughter confirmed. Gaynes starred in all seven Police Academy movies and had a lead role in the 1980s sitcom Punky Brewster. He also performed alongside Dustin Hoffman in the Oscar-nominated film, Tootsie. His longtime agent, Jonathan Howard, told The Hollywood Reporter that his death was "a sad, sad loss. But he had a really long, great life." Born George Jongejans in Helsinki, he was raised in France, England and Switzerland. A talented singer, after World War II he moved to the US and joined the New York City Opera, before starring on Broadway. He appeared on many TV programmes including Mission: Impossible, The Six Million Dollar Man and Hawaii Five-0. But he is perhaps best remembered by cinema fans as the loveable, bumbling Commandant Eric Lassard in the Police Academy series. Gaynes retired in 2003 after playing in the feature comedy Just Married, alongside Ashton Kutcher and Brittany Murphy. He is survived by his wife, actress Allyn Ann McLerie, his daughter, and grandchildren. His son, Matthew, died in a car crash in 1989.